Hope for a big slice of Irish luck in Rainbow Riches Drops of Gold, another in Barcrest’s series of Lucky Leprechaun-themed video slots. This one comes with a special set of Rainbow Reels that can drop extra wilds onto the main set. You’ll also find a bonus round that awards up to 32 free spins. Opt to spin in Big Bet Mode and you’ll bring plenty of extra goodies into play. Stakes range from between 10p and £500 per spin. The design here has the look of a classic fortune-themed video slot. Joining the lower value playing cards are harps, toadstools, horse shoes and violins as well as the Rainbow Riches logo which offers awards of up to 250 coins per payline. Above the main 50 payline reel set are the Rainbow Reels. These feature gold and silver pots which are both wild (the gold replaces everything including the bonus, the silver everything bar the bonus). These can drop onto the main reels set if you land a Drops of Gold symbol on reel 5 on the Rainbow Reels – this is called the Drops of Gold Bonus feature . A new payout is made with the all the extra wilds in play. Drops of Gold also comes with a Free Spins Bonus feature – you’ll get 8 free spins if you land 3 bonus symbols plus 4 extra free spins for any additional bonus symbol. You can retrigger more free spins too but there’s a total of 32 to be played with. This being a Barcrest title, you’ll also be able to up your stakes and play in Big Bet mode. This series of 5 linked spins are played on an expanded 100 payline main reel set and come with extra goodies. They include extra wild pots on the Rainbow Reels, spins with all of the lower value playing card symbols removed, longer than usual Drops of Gold symbols on the Rainbow Reels which makes it easier for the wild pot drop to hit and a 100 payline game engine (200 if you subsequently trigger the Free Spins Bonus feature). Big Bet starts at £20 but can reach £50. The higher the stakes, the more extras are awarded. The Return to Player rate improves as you up the stakes too. At stakes of under £2 per spin it’s 94% – in Big Bet mode it rises to 97.75%. As usual, Big Bet mode offers the best winning chances if you have the bankroll for it. Rainbow Riches is one of the most popular video slot franchises around. 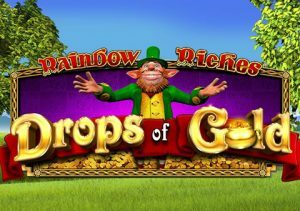 If you enjoyed the Lucky Leprechaun’s previous outings you should find plenty to like in Rainbow Riches Drops of Gold. The Irish luck theme is very popular and if its gold at the end of the rainbow you’re looking for, Shamrockers Eire to Rock by IGT is highly recommended.